We are remarkable entity, engaged in offering superior quality Burette Stand. 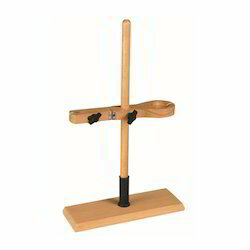 we offer Burette stand wooden for single and double burettes. We are manufacturing, suppling Double Burette Stand Wooden. We are a top-notch organization, engaged in providing Burette Stand Double. 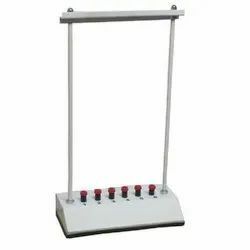 We are engaged manufacturing and supplying a wide range of Laboratory ware, which includes Test Tube Holder, Lab Jack, Tripod Bases, Bunsen Burner Propane Gas and Buret Stand Wooden. These are individually inspected and approved by our quality controllers to deliver safe and flawless products to our clients. Our range finds widely used in research labs for performing various experiments. The base and the rod have no exposed metal parts to corrode. The polypropylene thick, weighted, stable and smooth base has a deep thread for 1.25x75cm long polyethylene coated steel rod to be screw fixed. Glass agencies are manufacturer of burette stand wooden under erose brand. Retort stand is made up of pp , even rod is also made up of pp. So it is used for long time rather then metal one. sizes are 225x150 200x300 mm. We are a top notch supplier of Burette Stand Wooden DoubleBurette stand wooden double. We are a top-notch organization, engaged in providing Burette Stand. Features: moulded retort stands provide excellent replacement for the metal ones.